Water stress and drought are as old as civilization, and while human beings have devised many ways to guard against these threats, economies have evolved in ways that make us more vulnerable. Recent water-related tragedies in Syria, Africa’s Sahel region and elsewhere present the prospect of darker times ahead, but there are many things we can do right now to improve the chance for a soft landing and a brighter future. This won’t happen on a business-as-usual path, however. We are going to need to do things very differently, and most people do not like change. But if the choice is change or die – and it could be – then clearly we need to change our relationship to water. In February 2012, the U.S. intelligence community produced an assessment of global water security, predicting that without improved water management, freshwater availability would fall short of demand in the years ahead. The assessment warned that water problems, combined with poverty, social tensions and ineffective leadership, could lead to social disruption and state failure. Over-pumping of groundwater could pose a risk to national and global food markets, the assessment said, while water shortages, combined with pollution, could hurt the economic performance of key U.S. trading partners. The publicly available version of the assessment did not name specific countries, but it noted that North Africa, the Middle East and South Asia would face major challenges. The intelligence community assessment also noted the likelihood that climate change would redistribute global water supply, from the mid-latitudes and dry tropics to the high latitudes and some wet tropical areas. The mid-latitudes areas, some of which are already highly water-stressed, would thereby get even more stressed. Furthermore, over the course of the 21st Century, water stored in glaciers and snowpack are projected to decline, impacting millions of people depending on meltwater. In addition to these climate change impacts on water, an increase in extreme weather events is expected to lead to increasingly severe droughts and floods in many areas around the world. Five years since the intelligence community assessment was published, the effects of water stress can be seen in the daily news. In 2015, over 1 million migrants and refugees streamed into Europe, precipitating political crises among and within EU member states. Most of the refugees came from Syria, Afghanistan and Iraq. In May 2017, a leaked German government report warned that up to 6.6 million migrants and refugees were waiting to cross into Europe from Africa and the Middle East. They included refugees from Syria and Iraq, but also economic migrants from Libya, Niger, Chad, Nigeria, Bangladesh, Guinea, Cote d’Ivoire and the Gambia. This prolonged migration crisis — driven in part by water scarcity — has had profound political impacts in Europe and the United States, influencing elections in European countries, helping to trigger Brexit and even influencing the U.S. election that ushered in Donald Trump. The role of drought in helping to ignite the civil war in Syria has been well documented. For decades, Syria’s food and agricultural policies aimed for food self-sufficiency, especially in cereals. These policies dramatically increased food production as the population grew from 4.5 million in 1960 to nearly 23 million in 2013. The growth in food production was made possible by large government subsidies for agricultural inputs, including for diesel fuel to pump groundwater. But the new levels of food production were unsustainable, as they required a lot more water than is available on an average annual basis. The result was a dramatic decline in groundwater levels and a dramatic rise in Syria’s drought vulnerability. At the same time, the climate record for Syria and the greater Fertile Crescent over the past several decades reveals decreasing rainfall and increasing temperature, punctuated by increasingly frequent drought. Syria hadn’t recovered from the 1990s drought before collapsing again into the worst drought in the instrumental record. 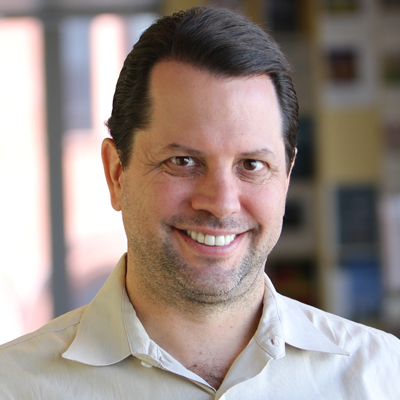 A 2015 study by Colin Kelley and co-authors in Proceedings of the National Academy of Sciences observed that “rural Syria’s heavy year-to-year reliance on agricultural production left it unable to outlast a severe prolonged drought, and a mass migration of rural farming families to urban areas ensued.” Estimates of the number of Syrians displaced by the drought run as high as 1.5 million. Add to this pressure on Syrian cities an influx of 1.2-1.5 million Iraqis between 2003 and 2007, high urban unemployment, poor urban living conditions, the Assad regime’s poor response to drought refugees and the influence of the Arab Spring in the region, and you have a recipe for civil war. Akkadian Empire. One of the earliest examples took place in what is now Syria some 4,200 years ago. Archeological evidence and regional paleoclimate data implicate an abrupt onset of arid conditions – lasting a few centuries – for the demise of this sophisticated culture. Old Kingdom of Ancient Egypt. Meanwhile, in neighboring Egypt, the same long-term drought that afflicted the Akkadians shrank normal flooding along the Nile River and led to the collapse of the Old Kingdom. Tang Dynasty. At the same time, in Asia, the Tang Dynasty in China began to weaken and then collapse due to prolonged drought and crop failure. The Anasazi. In the U.S. Southwest, tree-ring evidence shows a prolonged drying that led to the collapse of the Anasazi cliff-dwelling civilization around 1,275-1,300. Khmer Empire. The Khmer Empire based in Angkor, Cambodia, saw its demise during the 14th and 15th centuries, the product of a decades-long drought punctuated by intense flooding. Ming Dynasty. China again faced drought and widespread famine under the Ming Dynasty, which led to its collapse in the 17th century. Could better water management have saved the day? Probably not, as the war in neighboring Iraq put pressure on Syria, and Syrians, like many of their Arab neighbors, were greatly dissatisfied with their authoritarian rulers. But the worst might have been averted. Relying on unsustainable amounts of groundwater heightened vulnerability in two critical ways. First, it sent a faulty signal to the Syrian population that the country’s natural resources could support more people than they really could. Second, when the big drought finally arrived, there was precious little groundwater left to help buffer the drought’s impacts. Unfortunately, Syria is not the only place on Earth where groundwater resources are being vastly overexploited. But for many of the other places there is still a chance to mitigate future catastrophe. The Sahel, a narrow band of semi-arid land stretching across Africa south of the Sahara, has a split personality. When enough rain falls, it is a productive crop and grazing region that can support robust populations. Unfortunately, this is also a region that has regularly suffered decades-long droughts over the past 12,000 years. Research by the Joint Institute for the Study of the Atmosphere and Ocean at the University of Washington reveals that the Sahel entered one of these prolonged drought periods beginning in the 1970s. With some yearly exceptions, this drought has continued through present day. Lake Chad, which is bordered by Chad, Niger, Nigeria and Cameroon, was once the sixth-largest lake in the world, but has shrunk by over 90 percent in area since the drought began. In the 1990s, the use of water from Lake Chad for irrigation began compounding the problem of drought and led to further shrinking of the lake. This natural catastrophe has had dire consequences for the region’s 30 million people, who depend on the lake for their survival. Frequent disputes between farmers and herdsmen over access to water and land often escalate into violent clashes. Drought and famine killed nearly 200,000 people in the Sahel in the 1970s and, over time, have led to mass migration out of rural areas and into cities, including Dakar, Senegal; Ouagadougou, Burkina Faso; Niamey, Niger, and Bamako, Mali. These cities now hold about 25 percent of the Sahel's population and each year grow by another 5 percent. Drought and famine have also given rise to terrorist organizations in the region. Today it is Boko Haram, but one environmental activist recalls the notorious Maitatsine Islamist sect that terrorized northern Nigeria in the 1980s. A regional study notes that most of those who took part in these religious riots were originally farmers and pastoralists “impoverished, devastated and dispossessed of their means of subsistence and production such as farmland and livestock.” The same has been observed more recently of captured Boko Haram insurgents. Under interrogation, it was found that 70 of these insurgents were not religious fundamentalists, but instead “people displaced by severe drought in neighboring Niger Republic.” The impacts of this drought are also being felt in North Africa and Europe, as many young men from the Sahel emigrate to try to earn money and send remittances home to destitute families. In another part of the Sahel, in western Sudan’s Darfur region, prolonged drought was also at the root of a conflict that claimed hundreds of thousands of lives and displaced an estimated 2 million people. Many other factors helped trigger the conflict that broke out in 2003: central government disregard for Darfur’s economic development needs; armed conflicts in neighboring Chad and Libya and consequent easy access to weapons; changes to traditional governance structures that had previously helped settle disputes among local tribes, and exploitation of inter-tribal animosities by the central government in Khartoum. But it was prolonged drought conditions and desertification in Darfur in the 1980s and 1990s – together with population growth – that precipitated a sharp decline in food production and unsettled long-standing agreements between herders and farmers, bringing the crisis to a head. 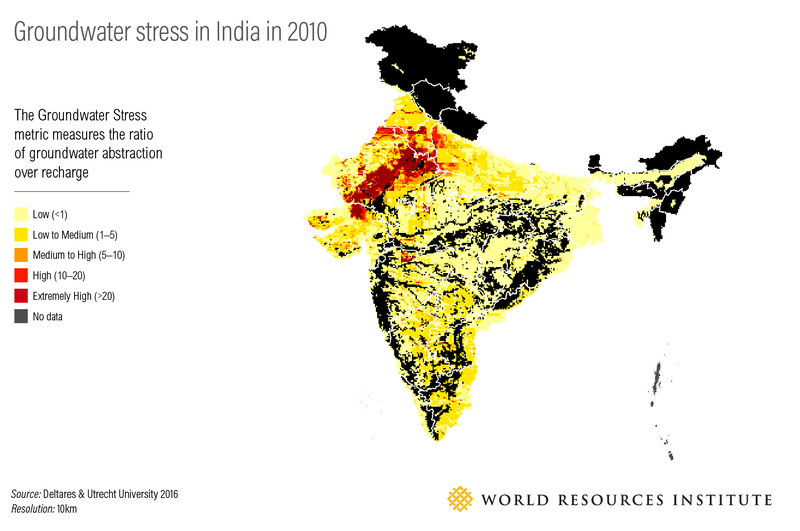 Nowhere on Earth is groundwater declining faster than in northwestern India. NASA’s twin GRACE satellites, which can detect changes in groundwater from space, found that large-scale irrigation caused 108 cubic kilometers of groundwater loss in Haryana, Punjab, Rajasthan and Delhi between 2002 and 2008. Without taking measures to ensure sustainable groundwater usage, NASA warned that over 100 million people could face a collapse of agricultural output and severe drinking water shortages. In July 2012, roughly half of India’s population – about 670 million people, 10 percent of the world’s population – temporarily lost power after a massive grid failure. Some experts blamed the severe drought affecting northern India. Low rainfall restricted the amount of power delivered by hydroelectric dams and farmers used more power than usual to run water pumps to irrigate their crops. Water shortages in India routinely cause heavily water-dependent thermal power plants to shut down, in part or entirely, for significant amounts of time. A recent WRI study found that between 2013 and 2016 India’s thermal power sector lost over 30 TWh of potential electricity due to water shortages. Intermittent water supply can wreak havoc on India’s urban and rural populations, with water tanker trucks needed to supply villagers during drought and a high suicide rate among small-holder farmers burdened with heavy debt and unable to eke out an existence from the land. Scarce water supplies have also sparked heated competition among Indian states. For example, when the Indian Supreme Court ordered the state of Karnataka to release water from its reservoirs to relieve drought-stricken farmers in neighboring Tamil Nadu in September 2016, there were protest riots in Karnataka’s capital city, Bangalore, until thousands of police were deployed to restore order. China. Much of northern China is relatively dry, yet it has also traditionally produced significant amounts of wheat and other grains using water-inefficient irrigation practices that flood fields. Add to this inefficient system skyrocketing water use by industry, energy and municipalities, and China’s future may be at risk. Government officials are taking action. Water is now one of China’s public policy priorities, and the central government recently launched a Three Red Lines policy to arrest water quality declines, improve water use efficiency, and place caps on water demand. It has also begun piloting the establishment and trading of water rights, assisted by WRI and its partners in Ningxia Province. Yet it remains unclear whether these policies will be sufficient to overcome the country’s vast water challenges. Brazil. In 2015, parts of southeastern Brazil, including the cities of São Paolo, Rio de Janeiro and Belo Horizonte, struggled through the worst drought in 84 years, with 40 million people and the nation’s economic heartbeat at risk. Reservoirs that supply water to these cities fell to dangerously low levels. Many of these reservoirs are also highly polluted, which complicated things even further. At the low point of the crisis, there was even talk of the possible need for emigration (“water refugees”) and bringing in the military to help out if the situation were to descend into chaos. 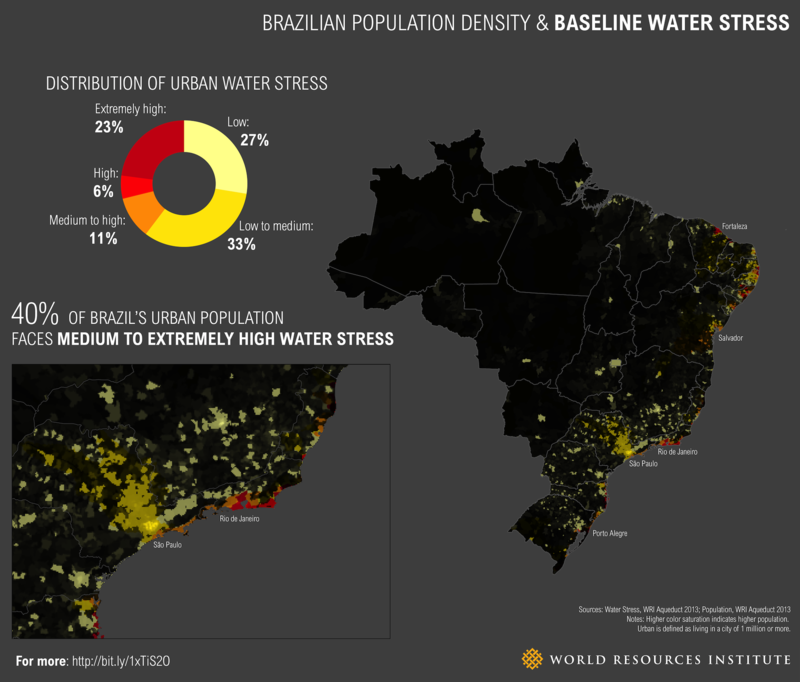 The drought has since eased, but the episode revealed the growing water stress that many of Brazil’s major cities are facing, and how vulnerable they have become to drought. It also revealed how unprepared Brazil’s government is to respond to this growing vulnerability. Indonesia. Water resources on Indonesia’s island of Java are under great stress. Java is home to nearly 60 percent of the country’s population (over 140 million people), but less than 10 percent of the country’s water. Surface water stress on much of Java was “high” or “extremely high” as of 2010, and could grow much worse between 2010 and 2040, driven by increased water demand. The problem of water stress is compounded by poor water quality. Weak water institutions and governance structures, together with widespread corruption, mean that much of the country’s wastewater is dumped untreated into surface water bodies. Many of the country’s groundwater aquifers are also dangerously polluted. Groundwater pollution is exacerbated by heavy groundwater pumping in coastal areas, which causes saltwater intrusion into aquifers. Heavy groundwater pumping also leads to high levels of ground subsidence in urban centers such as Jakarta, which exacerbates the effects of flooding in coastal cities. In parts of Jakarta close to the ocean, the ground has sunk more than four meters (13 feet) since the mid-1970s. Charles Iceland (right), Robert Speed (left), and WRI China are working with officials in Yanchi County (in Ningxia) to pilot the assignment of water rights to farmers in China. With the global population projected to rise to nearly 10 billion by mid-century, there is widespread recognition of the need to increase the global food supply by some 60 or 70 percent by 2050. If food supply cannot keep up with growing demand, the UN’s Food and Agriculture Organization warned in 2014, “there will be a high risk of social and political unrest, civil wars and terrorism." However, it is difficult to imagine how to boost food production by 60 percent over the next 35 years or so, given declining groundwater resources in many areas of large-scale irrigation, loss of enormous amounts of arable land over the past 40 years due to erosion and pollution, the need to limit further agricultural expansion into native ecosystems like forests, the need to reduce greenhouse gas emissions from agricultural production, and the prospect of more frequent droughts and floods leading to crop failures. Despite these challenges, we can – and we must – create a sustainable food future by implementing a menu of solutions to feed a world of 9 billion people in 2050 (more on some of these solutions below). Two recent crises have shown how global food security issues are likely to play out. In 2008, riots over soaring food prices erupted in developing countries from Haiti to Bangladesh to Egypt. 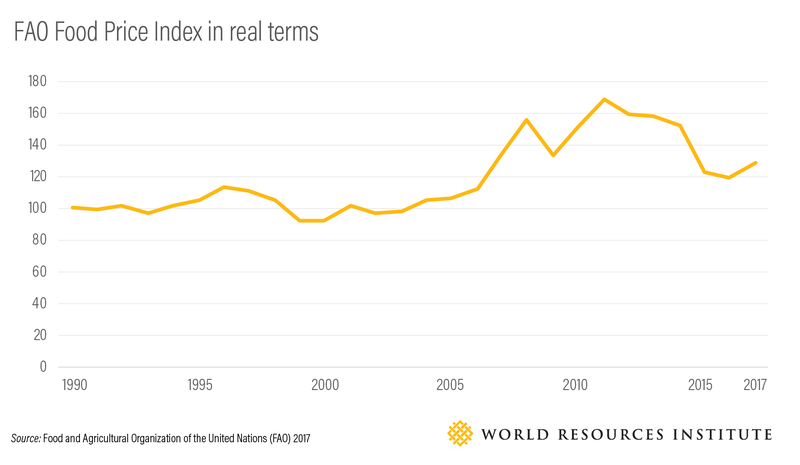 The prices of wheat and rice nearly doubled between mid-2005 and 2008, due to a host of factors, including drought and crop failures, grain export bans, rising oil prices (crop production and distribution is very energy-intensive), low grain reserves, diversion of cereals to biofuels production and increasing per capita meat consumption in developing countries. Food price increases can be devastating to families that spend 40 percent or more of their income on food, resulting in stunted growth in children, malnutrition and even death. In 2011, food prices spiked again, this time because of the 2010 droughts in Russia, Ukraine, China and Argentina and torrential storms in Canada, Australia and Brazil. The Middle East and North Africa region is one of the top food importers of the world, and is thus highly vulnerable to changes in food supplies and food prices. Some experts believe that the 2011 food price spike helped usher in the Arab Spring. These experts believe that the Arab Spring would have come one way or another, but the food price spike helped it come earlier. How should the global community respond to the growing water crisis? There are many things we can do right now to improve prospects for a brighter future. Develop water data and information systems. Effective management of water resources requires data and information to allow managers to set priorities, measure baseline conditions and evaluate progress towards achieving goals. WRI’s Aqueduct™ online water risk tool is an example of a resource that can be used at a strategic level by national decision-makers to identify long-term priority issues and geographies. Other tools can evaluate conditions and measure progress at much more local project levels. Still others allow users to identify the onset and magnitude of drought or flood events in near real-time. Whatever the challenges, good data and information systems are a key. The United Nations, for example, is in process of developing robust data and information systems to track progress towards meeting its Sustainable Development Goals. One of these goals includes ensuring sustainable withdrawals and supply of freshwater by 2030. The indicator it will use to measure baseline conditions as well as progress towards this goal is water stress (the same indicator that is used on Aqueduct). Cap water usage. In a watershed where water demand is unsustainable relative to long-term water supply, bad things begin to happen. Water users fight over scarce supplies, with poor people often squeezed out. Groundwater levels fall. Local ecosystems begin to degenerate. In these instances, governments need to intervene and set a cap on total water usage in the watershed. The water demand cap is set relative to water supply, which varies from year to year. Governments then need to engage with local stakeholders to identify ways to reduce total water demand to the level set by the cap. This approach has proven effective in places as different as Australia, China, and the United States. Effective governance systems are needed to ensure that equitable distribution of water takes place, and the poorest and most vulnerable retain access to needed supplies. Employ water-efficient technologies and practices. There are many technologies and management practices that can help reduce water demand or boost water supply. These include switching from flood irrigation systems to drip irrigation systems, re-using treated wastewater, capturing rainwater, detecting and fixing leaks in urban water systems (leaks often lead to losses of 40% or more in urban water systems), and many others. Plant water-efficient and drought-resistant crops. In water-scarce and drought-prone areas, farmers should consider switching to more water-efficient and drought-resistant crop varieties. This may sound obvious, but there are many cases – such as Pakistan and Mexico – where water-guzzling crops such as sugar and cotton are grown in highly water-stressed areas. Identify cost-efficient ways to reduce water pollution. In many countries, surface water and groundwater sources are too polluted to use, even for irrigation and industrial purposes. Water supply can be freed up by identifying cost-efficient ways to control and treat effluents from farms, industries and municipalities. Expand green and gray water storage infrastructure. Climate change will make temperatures hotter and rainfall more erratic, increasing the frequency and magnitude of droughts and floods. Wetlands, forests, and other natural landscapes that can store and slowly release water, as well as dams, groundwater recharge projects and other green and gray infrastructure will be key to helping countries cope with these changes. Raise water prices. In most countries, water prices are too low. This prevents water utilities and other water infrastructure systems from recovering costs, paying down capital investments, and undertaking annual maintenance activities and water-saving improvements. It also fails to convey to users the fact that water is scarce and should be used efficiently. There are ways to increase prices while still ensuring that poor people retain access to clean water for drinking and sanitation. In Ouagadougou (Burkina Faso), for example, ONEA, the utility responsible for water and wastewater services, provides piped water to 94% of the population (including most of the poor population), almost 24 hours per day. It is also performing very well financially, with positive cash flows and low non-revenue water (water lost through leaks or theft). ONEA and a handful of other water utilities in Africa have been identified by the World Bank as examples of companies that can both serve the poorest and stay afloat financially. Improve water management and water governance systems. In most countries, responsibility for water management falls under various government entities that fail to adequately communicate with one another (e.g. the agency that approves new housing developments does not communicate with the agency that provides water and sewage services). Often the most powerful government agencies (e.g. the ministry of finance) do not understand the true value of water for the economy. Finally, corruption and lack of enforcement of laws and regulations often impede effective water management. All these shortcomings need to be addressed. Interventions unique to dryland farming areas. Dryland farming areas, which depend exclusively on rainfall, present unique challenges. In many parts of the world, over-grazing and removal of trees have left landscapes barren and degraded. Without vegetation cover, topsoil is lost. Land becomes cracked and covered by hard crust, unable to retain rain water. In many places, land restoration, re-greening efforts and improved land management have reversed these trends, and had the positive side effect of increasing groundwater recharge. The Tigray region of northern Ethiopia is a case in point. Land degradation once forced many to emigrate due to land degradation, but the land – and its people – have come back following 20 years of restoration efforts, including: closing the land to grazing (herders are permitted to cut grass and bring it to livestock); building gabions (mesh cages filled with rocks) in chasms to slow the flow of rain water and build up earth behind them, and planting trees to slow the destructive velocity of surface water when it hits the valley. Similar land restoration, re-greening and water harvesting efforts have taken place throughout the African continent. Reducing portion sizes (consumption stage). A second imperative is to shift global diets: the type, combination and quantity of foods people consume. A number of factors are driving a global convergence toward Western-style diets that are high in calories, protein and animal-based foods, which are more water-intensive to produce. Meat from ruminants—beef, lamb and goat—stand out in particular in terms of high resource requirements. To reduce the burden that 10 billion people in 2050 could impose on Earth’s natural resources – including freshwater resources -- it is important to help those who consume high amounts of meat (and especially ruminant meats) to shift to a diet with a greater share of plant-based foods. Learning from the strategies employed in previous large-scale shifts in consumer behavior can help inform future efforts. Reducing infant and child mortality. These strategies are particularly important to pursue in sub-Saharan Africa, where food demand is projected to more than triple by 2050, largely due to high projected population growth. Countries like Botswana and Rwanda are already leading the way. Additional progress across the region could improve health and education outcomes, lead to economic benefits and ease water and food challenges. Multifaceted solutions for multifaceted problems. This essay was intended for people who want to better understand the role of water in driving conflict and migration in today’s world, and what can be done to reduce water-related risk. Water risk is clearly not the only driver of the conflict and migration we have been witnessing. It should go without saying, therefore, that decision-makers hoping to reduce human suffering, conflict and migration also need to focus on actions that target the many other drivers, be they political, social, or economic. In many places throughout the world, we are using up water more quickly than it is being replenished, creating dangerous short-term and long-term vulnerabilities for human populations and the environment. In Syria, excessive extraction of groundwater and recurring drought proved catastrophic to rural societies, and then had knock-on effects that led – along with other major drivers – to civil war. In the Sahel, prolonged drought is forcing millions off the land, into regional cities and across the Mediterranean to Europe. In India, chronic over-use of water is leading to economic underperformance, human suffering and the threat of humanitarian catastrophe. China, Brazil and Indonesia also face large and growing water-related risks that threaten economic prosperity, and political and social stability. Overuse of groundwater in many of the world’s major irrigated areas threatens our global food system. As we saw in 2008 and 2011, crop failures in multiple regions can increase food prices and limit food availability worldwide, leading to political instability. There are many things we can do to reduce water-related risks, but it is vital for local, national, and international leaders to take decisive action while conditions still permit us to act. From capping water use to planting more water-efficient crops, from restoring landscapes to cutting food loss and waste and making people’s diets more sustainable, there are many options for reducing the burden we place on our freshwater resources. But we need to take these actions now to prevent human health crises, declining economic and employment prospects, and increasing conflict over scarce water resources. History shows that once war grips a region, it is too late for governments and civil society to take meaningful risk-reducing actions.